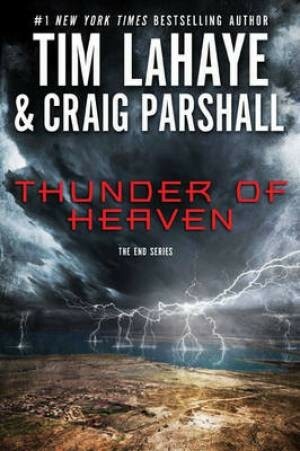 The End Series by New York Times bestselling author Tim LaHaye and Craig Parshall is an epic thrill ride ripped from today’s headlines and filtered through Scriptural prophecy. Edge of Apocalypse (End Series vol 1), Thunder of Heaven (End Series vol 2), Brink of Chaos (End Series vol 3), Marl of Evil (End Series vol 4). As world events begin setting the stage for the “end of days” foretold in Revelation, Joshua Jordan must weigh the personal price he must pay to save the nation he loves. Thunder of Heaven appeals to the tens of millions of readers who have already made Tim LaHaye a household name and one of the best selling authors of all time. This book is a return to form for Tim LaHaye whose previous prophetic fiction series, Left Behind, has sold roughly 70 million copies. Those who have read Left Behind and are eager for more highly charged fiction based on biblical prophesies will embrace Thunder of Heaven for the same reasons that turned Left Behind into the world’s most celebrated publishing phenomenons of the last two decades. Great story line! I love the hidden Biblical messages from God in the story. I found myself rethinking or adjusting aspects of my own life! It was like I was watching a movie! I gave Edge of Apocalypse a 5 star rating and can do no less for Thunder of Heaven. If I was watching this as a movie, I would be on the edge of my seat and totally focused on what was happening. What a description of the invasion of Israel and the total upending of that invasion. This invasion could happen in our days. We know it will happen before the beginning of the Tribulation, but does the Bible give any time frame for it? Whether the invasion happens before or after the Rapture, it will take 7 years to clean up the mess. But happen it will and God will send thunder from heaven! I truly enjoyed this book and look forward to the next in the series.